So the nice thing about having multiple non-confusing broadly supported formats: you can have Holocrons. Basically each format can have its own banlist. A straight-up banlist is far preferable to the nerftatta FAQ we currently have. But it would cause (justified) anger in the current "100/6 or GTFO" atmosphere, because it would basically be FFG saying "haha, get rekt scrubs, you just bought a bunch of stuff that's now worthless! Maybe buy our new broken OP releases and hope we don't nerf those too? Lol." But if they ban Miranda in 100/6 3x3 but she's still legal in 150/8 4x3 or 300/12 6x3, for example, it's better. Oooh, I'd hate to be the judge that has to remember three different ban lists! Oh wait.... DANG IT! @Kieransi - love the enthusiasm, I can relate to it, and by all means develop your idea.... I'm out though. Where is the power of the Krayt's power over the game?? I keep refreshing the forum and site in hopes of a Friday FAQ; let's all keep pushing for it! .....though the developers probably don't read much of this crazyness. Armada not only got an FAQ, they got mostly what the community had been asking for - down to one specific detail that I only found mentioned in one spot. I would not underestimate FFG's ability to publish things at odd times. I could be completely wrong here, but it seems to me that many of the problems we have with the current state of the game are to do with the current scoring system, and that things would go better if there was a rule change/alt format that means games rarely go to time. This means that defence stacking and regen (the two biggest NPEs as far as I can tell) have much less impact, and the idea of a point fortress is removed from the game. Obviously raising the time limit or abolishing it all together is a dumb idea, cos then we end up with infinite loopin chewie (actually is that even a bad thing). There are a few ways of making games less likely to go to time without raising the limit. The objectives format is an excellent example as it forces engagements. The above suggestions of smaller point totals/play area is another. Lots of the suggested fixes you see around here seem to push the game towards this. Things like 'Outmaneuver is a core rule' or 'regen is limited' would slightly lower the average number of turns of fire needed to kill a ship, shortening games so that they are less likely to go to time. 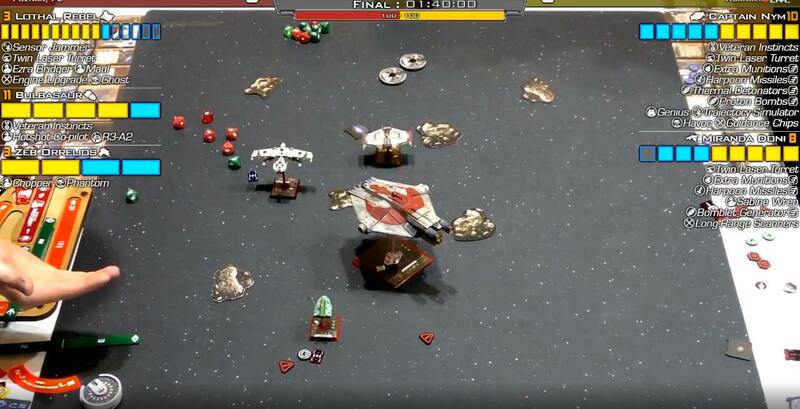 Or what about a rule change such as making the game end when a player only has 1 ship left (instead of 0)?Swarms and alpha-strikes everywhere anyone? I'm no expert on game balance so I have no idea how these would pan out in the long run though. I don’t have a solid answer for you, but I would like to chime in about scoring. Everyone was concentrating on draws being eliminated that we never really discussed the removal of modified wins. Modified wins really punished point fortressing as a strategy, because they tended to be close enough on points that you only got the modified win. If we go back to the old scoring, Kylo is 12 points more than Soontir so depending on the bid there is an incentive to hunt him down. Miranda mirrors get punished in Swiss because they can’t kill each other (even when they aren’t a perfect mirror, which slows down her binge eating problem). We have mostly all come to the conclusion that final salvo has perverse incentives on the game, but I’m pretty sure the removal of modified wins also had some serious negatives. When winning is winning, that 49 point Miranda looks pretty good when everyone else is running 48. When mod wins are a thing, you instead keep looking for a way to kill 48 Miranda. Mod wins were also arbitrary as to where the cutoff was. Personally, I'd be in with getting rid of final salvos and allowing draws. I'd add very unfortunate consequences if you drew in your final match too, like, "no plaque or bye awarded, but thanks for showing up and not going balls out!" bad. That may just be cause I'm a bit sick of trying to game the game instead of focusing on playing it. As much as I like breaking games, this isn't fun in the long run. It wasn’t super arbitrary, 12 points is still the cheapest possible full ship. I’m not a huge fan of draws, but I think they are better than not having draws in the current way. What would it look like if a tied state just gave both players the loss? Easier in Swiss, of course. Also, Jumpmastered has been used a verb to describe repeated nerfs in a game failing to produce an effect. WE DID IT! Too narrow! "Wow, the Dolphins really JumpMastered that 1st-and-goal from the 3, huh?" Where? Someone else besides me uses it like that? I know I was fighting with people online saying most of the miranda fixes I see aren't going to actually shift her from her place on top of the pile, and brought up how the suggested manaroo nerf was range 1-3 to make Dengaroo Harder- the forums never made the thought jump to "Why should Dengaroo be a thing at all"? I know I'm firmly on board with making Miranda's ability be offense-only. If you do minor **** like the suggestions I'm seeing, she's still going to be everywhere because we should have never had a regenerating High-PS fat bombing turret that carries ordinance with SLAM in the game. Every nerf I see that is "what if we make her less turrety when she regens" seems to have glazed over the bit that there's no reason for her to have to be able to regen at all. No other K-wing can, people don't yell that they want Esege to be able to regen. I don't know... I mean, it's clearly busted as all heck, but I find Miranda's ability to spend and recharge shields interesting. On a different ship it may have worked. A T-65? One thing I hope they fix in the future* is unique pilots who literally fly the same ship not being able to be doubled-up on. Dengaroo should never have been possible because Dengar and Manaroo literally fly the same ship, much like Han, Chewie, Lando, and Rey do. (and Dash and Leebo). It's not just that they fly the same model of ship, it's literally the same ship, so there shouldn't be two of it. * you know, whatever that happens to be. It was on the Armada forums, referencing 2+3. In terms of Miranda nerfs, I like it. Could also be fun to make the regen reliant on another friendly ship being at range one so she still works normally early, but once her buddy is dead, she is filled with rage and cannot regen - probably still broken though. I am preparing for my first trip to Worlds and need a little advice. Narrowed it down to two lists. To Meme or Not to Meme that is the question. Her ability would have been fine if she flew a PS8 Khiraxe; no whining, no OP, no problem....they put her in the most versatile chassis next to the pre-nerf Jumpmaster and have her a turret upgrade=stupid!! Perhaps mandatory equipping of the title? Super off topic, but I know everyone secretly wants to get into Legion as the CIS and yell "Rodger Rodger!" over and over- I'm looking into getting a large quanity of the old OOP 30mm Knight models recast- Would other people be interested? I'd have to convince the recaster that there would be a market. Well, I brought my raging ocho to a kit tournament. We only had four players, as it was the day after CAC. One guy brought Ghost Fenn, and I fortressed on it. 16 beats 9, but I never want to do that again.